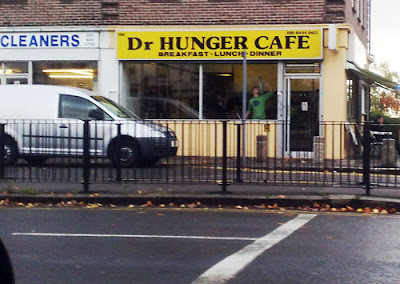 So, “Dr Hunger Café”; as in a café owned by a Doctor who cures hunger? Maybe, but then It should read “Dr. 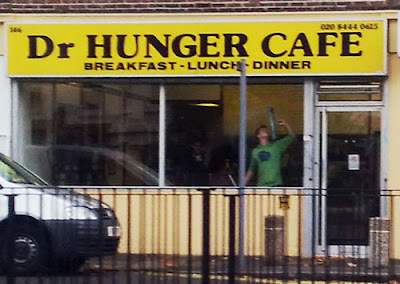 Hunger’s Café”. 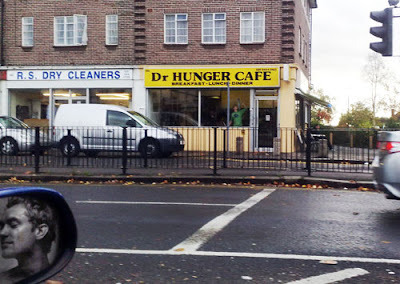 Is café a coincidentally apt second name for a physician who jacked it in to fry eggs for a living? Or should it be read with an assumed “the” prefix. “The Dr. Hunger café” is maybe then, a set of ideas. At the heart of which the concept of “Hunger” is given an authority by bestowing it a doctorate. Is this art? What is this? And then I noticed I had photo-shopped a little picture of Jude Law in the wing mirror, something I have very little memory of doing.